Are you coming home..? Watchfulness and pacing can indicate separation anxiety. Before I begin to write about separation anxiety, I would like to start by pointing out that every dog is an individual, and while the principles outlined here will apply to a greater or lesser degree, only you know your dog’s history and circumstance. It is important to begin there and to carefully work out – using behavioural clues – why your dog behaves in the way they do. No action plan could be suitable for all dogs, and whatever changes you choose to make should be carefully considered so that they suit your dog’s specific temperament and situation. This is part one of a two part article. Here we will discuss what separation anxiety is, why it occurs in dogs and how to decide whether this is what your dog is suffering from. Separation anxiety is a fear induced state of (di)stress, that a dog can develop when left alone, or separated from one individual, and which leads to certain undesirable behaviours. Dogs – as we all know – are usually extremely social creatures that are capable of developing strong bonds with humans, other dogs and individuals from other species. They develop and experience (feel) these bonds through exactly the same hormonal influences as we do, but are not capable of rationalising (thinking clearly about) them; something that we take for granted. When we leave our home – and our dog – we know that we fully intend to return, and that our relationship with our family will continue. Dogs do not have this luxury. When we leave them they have no way of knowing our intention, when we will return, or indeed if they will ever see us again. Since they also rely on us as the great resource provider in their lives, it isn’t surprising that our act of leaving can be a source of deep anxiety for them. As humans, we have a responsibility for our dog’s sense of safety and well-being. If our dog is distressed and afraid, there is only one humane response, which is compassion and comfort. All that our “problem” dogs are ever trying to do is to find a way to deal with of our confusing world. Our compassionate response to any situation that we know causes our dog distress, is always either to take them away from the situation, or to provide them with the skills to face the situation without distress. To expect them just to deal with whatever we throw at them is unfair and – for a truly anxious dog – quite traumatic. They need our solidarity and to know that we have their back. So we have two humane choices; either avoid or build their skills, and in the case of separation anxiety this means either don’t leave your dog, or teach him the skills to cope with your going. For more on this watch this video by Suzanne Clothier. It’s important to see from the outset that separation is not the natural state for a dog. Most puppies are distraught if they find themselves alone. Separation is something that is taught: a gradual programme of behavioural training, to lead a dog to a place of robust coping mechanisms. If this happens consistently and with compassion in the early life of a dog, the skills will usually become fixed, and future periods of separation will not be stressful. However, even the most robust coping skills can be demolished by trauma; the loss of a bonded human, the loss of a bonded dog, a house move or a home move. 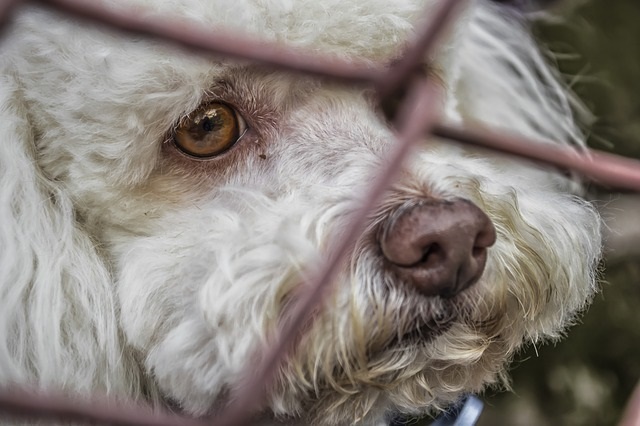 With the inevitable loss of all that is familiar, and often times an associated period in a rescue kennel, a home move can result in separation anxiety for many a rescue dog. This is made all the worse by the fact that separation anxiety is a common reason for a dog ending up in rescue in the first place. inappropriate over-bonding with a human especially in puppyhood, so that separation is not learned. a genetic predisposition, perhaps towards anxiety in general. trauma, such as the loss of a person or another dog or a house move. spending a period in kennels. an abrupt change in schedule, for instance from having someone at home full time, to being left alone during the work day. punishment on return after separation (for barking, chewing, scratching, toileting in the house and such like). How do I know my dog has separation anxiety? Boredom, loneliness, under-exercise and lack of stimulation can afflict many young ‘home-alone’ dogs and is not the same as separation anxiety. It can lead to destructive and noisy behaviours, and the inappropriate punishment on return for these, can lead to anxiety about your return. This can paint a very similar picture to separation anxiety, though these dogs do not tend to show signs of distress when you give cues that you are leaving the house. Some dogs can show some the signs of separation anxiety when their human is at home. If this occurs the problem is not separation anxiety but some other behavioural issue, such as, lack of toilet training. Digging or scratching at carpets, chewing skirting and other escaping behaviours aimed at getting out of door or windows. Whining, howling or barking around the point of being left. This often stops after 30 to 40 minutes, but some dogs can keep this up for hours. A distressed dog will almost certainly ignore even the most high value treats that are left. They will also be completely over the top in their greeting when you return. Barking as a clue to what’s going on. A dog who is suffering separation anxiety will often whine and howl, sometimes interspersed with barking. Repetitive monotone barking is much more likely to indicate a bored dog, while little runs of triggered barking interspersed with silence, is generally a reactive bark to things that are going on outside of the house. In part two we will consider ways to help dogs who get bored and lonely when they are left, and how to help those who have true separation anxiety. I really enjoy the look of your web blog. Not long ago I created my own and therefore I wanted certain style ideas and you simply provided me a few. Could I ask you if you made the blog by youself?